Today, Mary and I decided to take our longest trip since my open heart surgery on June 6, 2016. We drove a little less than 120 miles round trip to Sierra City and back home to Lake Wildwood. We stopped at Craig and Jodie's in Nevada City on the way home. It was closer to two hours on each leg than the 1.5 hours estimated by Google Maps because the roads were very winding, with long winter shadows that forced slow- downs at blind corners. We ate outside in a nice, quiet, shaded area with about seven metal tables and chairs like these. The restaurant is cozy inside and beautifully wooded outside. It has a good-size bar considering the small size of the restaurant. This is about half of it. This is one of the owners. Two wives cook and the husbands keep the place going. They've had it for a little over a year and it has rave reviews in Yelp, which is why I selected it. They have several cozy tables and cushy bar stools for indoor eating. They serve only breakfast and lunch. 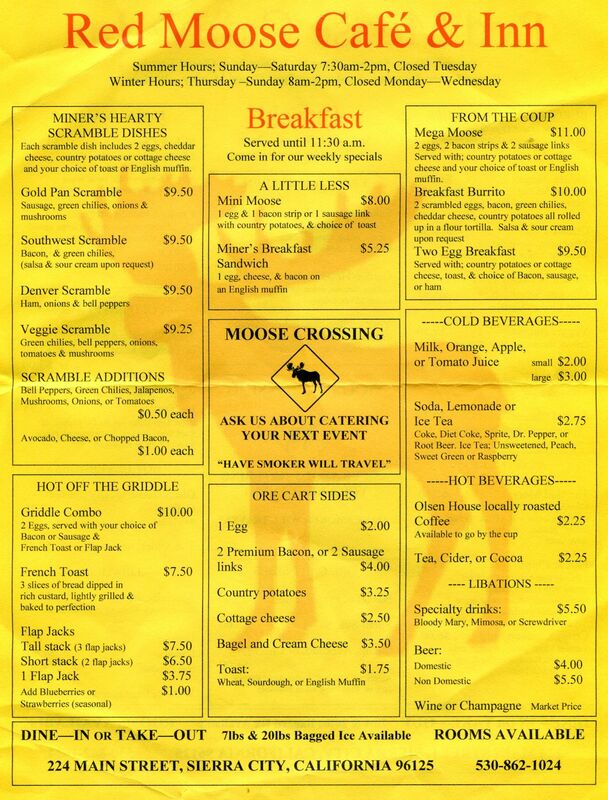 This was the breakfast menu on the day we ate there. 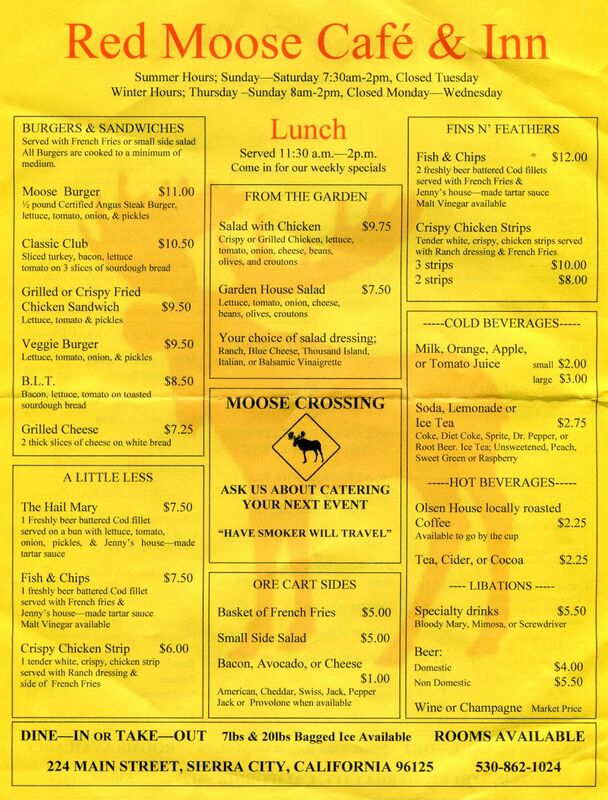 This was the lunch menu..
Mary is seated just outside the entrance, adjusting to the large chicken salad we each ate (A+). You'll spot this sign hanging in front of the cafe at the street on the right side coming from Downeyville. The restaurant is right on Hwy 49 going through town, less than half way. A couple from near Stocton took this photo of Mary and me on their way into the restaurant. This is two doors farther down the road from the Red Moose Cafe. Cabins at the Buttes Resort visible from the road. You can also see them right of the sign above.